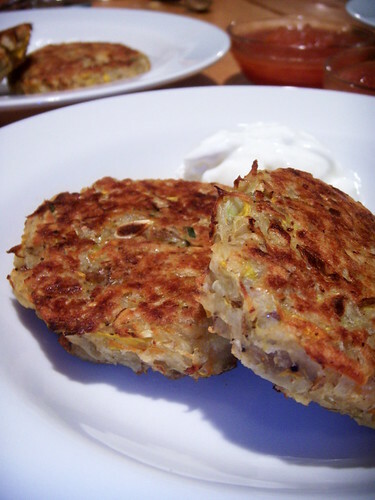 totally broke: baked root vegetable and squash latke with nectarine sauce and greek yogurt, originally uploaded by aarn! +23rd July, 2008+. grated and strained a mixture of homegrown yellow crookneck squash, potato, carrots, vidalia onion, garlic, and fresh tarragon, then mixed in some flour, a dash of cayenne, sea salt, fresh ground pepper, a handful of pankos, a beaten egg, and a splash of oil, shaped and placed on a oiled baking sheet. served with a reduction made from ground less-than-ripe nectarine, a spoonful of candied cherries, apricot juice, orange juice, a pinch of salt, and a spoonful of sugar. a dollop of strained greek yogurt completed the meal.